Pictured above, Village Green’s choir during a performance at the home’s Oct. 26 launch party for the OLTCA’s Better Seniors’ Care letter-writing campaign. Village Green residents have formed a choir at the Selby, Ont. long-term care home, and many are finding hidden talents, says life enrichment co-ordinator Karen Coulter. Karen says one of the benefits she has seen from the choir, which formed in August, is that singing has increased self-esteem for some of the residents. 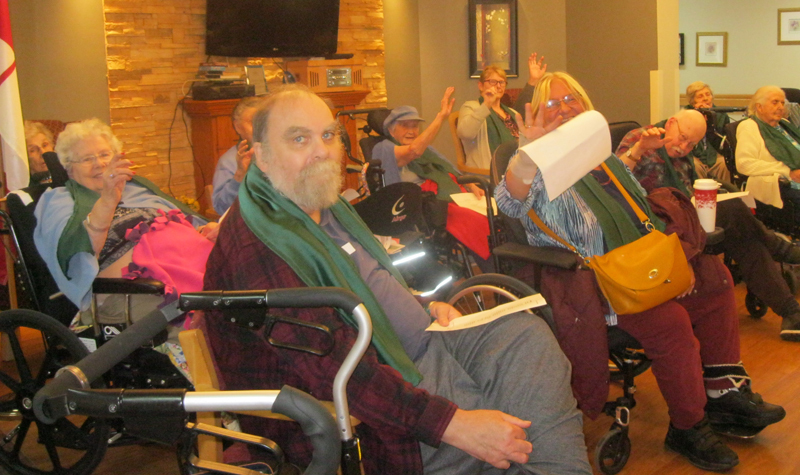 Most recently, the Village Green choir members, sporting the green scarves they wear, performed at the launch party for the home’s participation in the Ontario Long Term Care Association’s Better Seniors’ Care letter-writing advocacy campaign on Oct. 26. Their next performance will be at the Village Green resident and family Christmas party. Kenny, a pianist who often performs at Village Green, has been playing keyboard in the front lobby and residents have been singing to the music. They are currently practising once a week in preparation for the Christmas party. “Residents are just thrilled to be a part of the choir; it’s motivating for them, and they have been very proud of themselves,” Karen says. Karen says given that the choir has been successful at engaging residents and bringing out their singing talents, she recommends other homes consider starting their own choirs if they haven’t already. “The residents get right into it; it’s really great to see,” she says.